Well, maybe it's not completely old fashioned because it's my slightly adapted recipe from the classic pumpkin pie... But it is a regular ole pumpkin pie - no fancy add-ins or anything. I really like this version because it uses slightly more pumpkin puree and a bit less cream and sugar. I also like to keep the spices on the lower end so that the pumpkin flavor really shines through. I made the crust, the pumpkin puree, and freshly whipped up some unsweetened heavy whipping cream to top this pie. It was absolutely fantastic. We bought a sugar pumpkin back in October and have used it as one of our decorations through the fall season. But when we bought it, the understanding was that it was to become a pie once its decorating duties were complete, as requested by my husband. He waited patiently until after Thanksgiving -- I wasn't going to post it because I figured that most people have had their fill of pumpkin by now and have moved on to more Christmas-like treats. But while I was making this pie, I was listening to some Christmas music and realized that many of these songs reference pumpkin pie (think: There's No Place like Home for the Holidays or Rockin' Around the Christmas Tree or Sleigh Ride). It made me wonder why pumpkin pie seems to have been relegated to Thanksgiving. I think that pumpkin pie is a completely appropriate dessert all through the fall and winter. After all, winter squash is stored away for the winter and would be the perfect thing to make into a pie when the mood strikes. Around here, we love our brussels sprouts. I made this dish as a side for Thanksgiving dinner this year. Some people (like my mom and grandma) were a bit skeptical about the idea of shredding brussels sprouts, but I proved them wrong. While shredding may take some time on the front end, it allows them to cook up in a snap. This was the only part of the main meal at Thanksgiving that was completely gone after dinner. My husband requested to have it again soon -- so we did. I think this dish would be great for the holidays because of its green and red colors, plus chestnuts always feel festive to me. You can find them already roasted and shelled this time of year, usually in the produce section. Seeing that my husband just brought home two large stalks full of brussels sprouts from his dad's garden this weekend, I am sure this dish will be making its way onto our table a couple more times this season. This recipe will make a side dish for about four people. I think this pecan pie was the star of our Thanksgiving dinner this year. I know that I had a very difficult time resisting the temptation to eat a slice on Wednesday when I baked it. I've made a regular pecan pie before that uses corn syrup (it was one of my first posts ever on this blog. The photo is absolutely awful and the post isn't so great either. What a learning process this has been in terms of photography and writing. Certainly, I'm still not perfect at either of these, but definitely better than that pecan pie post and others from that time period.....) - Anyways, this time I wanted to try to infuse the pie with maple flavor to make it a bit more festive. The maple flavor is not strong, but subtle. The maple aroma, however, is really wonderful. It makes it extra special. Now I make a lot of things for people, and I knew that my mom loves pecan pie, but I've never had so many people swoon over my food as they did when I presented them with this maple pecan pie. It's a good thing I took these photos the day I baked the pie, because there was no opportunity for me to even attempt snapping a decent photo of a piece - it was gone in no-time flat. This recipe will make one 9-inch pie and is a perfect addition to any holiday table or for any special occasion. The Thanksgiving clock is ticking and I am ready to make and enjoy a wonderful meal. This will be my third time cooking Thanksgiving dinner. It's a tradition that I was more than happy to take over (and have not-so-secretly wanted to do so for a while). I only hope that next year we have a house to have it in... hosting Thanksgiving dinner in an apartment just isn't all that convenient sometimes. One of my favorite things is that I like to try to convert my guests to lovers of things like turnips, squash, brussel sprouts, parsnips, etc. Some of them already like these things, but some are still not sure... I try to "jazz" up some of these less-loved vegetables to get people as excited about them as I am. Sometimes it works, and other times, not so much. But, hey, you can't blame me for trying - there was I time when I thought I didn't like these vegetables, too. This delicata squash dish could be an interesting addition to your Thanksgiving table, or any fall/winter meal. The squash is sticky, smoky, sweet and all-around yummy. I do love delicata squash simply halved and baked with some butter and salt. It's think it has the most complex flavor of the winter squash. I also love that you can cut it up into rings and eat the skin. The below recipe uses one squash, which will serve two people as a side dish. You can easily adjust it to make a lot more if you want to feed a crowd. In my experience, most people don't get very excited about turnips. But, I'm not one of those people. In fact, I get pretty excited for all root vegetables and root vegetable season. Look at those lovely large pink turnips in the photo (I used much smaller ones in this dish). This time of year the food blogs are filled with recipes featuring pumpkins, other winter squash, and apples - rightfully so... but you don't see as many featuring turnips, rutabagas, beets, celeriac, parsnips, radishes, etc... Maybe next fall/winter I'll start a "roots" event because I want to try to use these vegetables in more creative ways as well. I almost start to squeal with delight when we are walking through the farmers' market and cute little white baby turnips begin to make their first appearance. I dream of the day when we have land for a garden and in my mind, my garden is almost exclusively full of root vegetables, winter squash, and herbs. I never even had turnips until the first Thanksgiving I was dating my husband. We were going to a dinner at his aunt and uncle's and she told him that we could "bring the turnips." I was in shock. Tunips?! I had never even tasted a turnip before, let alone cooked one. So, I searched the internet and found a recipe for roasted turnips. After searching the grocery store for turnips, I bought some, made the recipe, and hoped for the best. Well, they were delicious and everyone enjoyed them. Now that I make Thanksgiving dinner, I almost always have a turnip side dish to try to convert more people to turnip lovers. This gratin is lightened up because it doesn't contain any cream - although this dish is probably still a little heavy for a Thanksgiving side dish for me. One thing I don't like about the fall and winter is that by the time I'm able to cook and take photographs on most days, it's dark. That makes photography really difficult. We don't have a lot of lights in our apartment. Even though I have a couple good flashes for my camera, I'm not overly skilled in their use yet... So, I am feeling more disappointed in my food photos as the season changes. It's amazing the difference natural light makes. Anyways, that is my apology for the photos here and probably to come as we move through the autumn and winter. However, one of my favorite things - winter squash - makes up for it a little. I've been participating in 12 Weeks of Winter Squash hosted by Eats Well With Others and Girlichef. Anyone familiar with my blog knows that I adore winter squash in both sweet and savory dishes. So this event is a perfect way for me to try even more winter squash recipes. At the beginning of this year, I made pierogi for the first time. I loved how delicious they were and how easy they were to make. I've made the potato and cheddar ones a couple times now, but have been wanting to experiment with other fillings. Winter squash stuffed into a slightly chewy and lighty golden pierogi seemed like a no-brainer to me. I chose kabocha squash because not only are they really delicious, but they have a smooth texture and tend to be denser and drier that other winter squash (so they don't let off a much liquid with you are trying to fill the pierogi). The result was a creamy and super delicious filling with only a few simple ingredients. The dough recipe comes from Closet Cooking. This recipe will make approximately 20 pierogi. Today I have something a little different to post. My friend Faith Gorsky from An Edible Mosiac just had her first cookbook released: An Edible Mosiac: Middle Eastern Fare with Extraordinary Flair. I'm excited to be participating in her virtual book launch party and sharing a recipe from the book! Thanks to Faith for asking me to participate - one of the best things about food blogging is the great community. 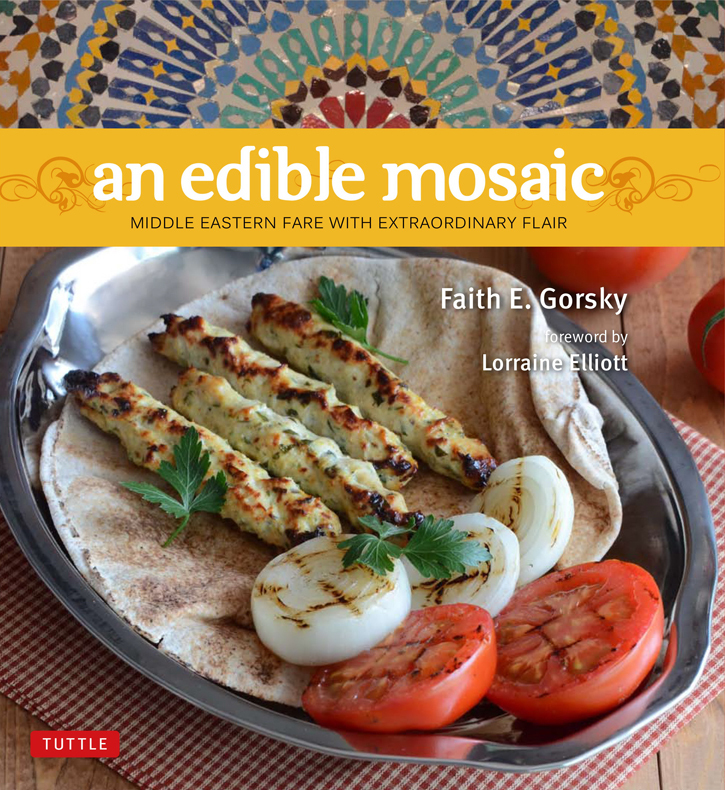 The book has over 100 Middle Eastern recipes, with a focus mainly on dishes from the Levant, but also a few recipes from other areas of the Middle East. Faith has a pretty unique story....after getting married she spent six months living in the Middle East, where she fell in love with the culture and cuisine. Subsequently, she returned four more times for visits, each time delving deeper into the cuisine and deepening her passion for and appreciation of the region. Recipes in her book are authentic Middle Eastern (taught to Faith mostly by her mother-in-law, Sahar), but streamlined just a bit for the way we cook today, with unique ingredients demystified and cooking techniques anyone can follow. The book is available to order on Amazon and Barnes and Noble! I had my first taste of pumpkin ice cream a few years ago at a local ice cream shop. Ever since then, we go there each year in early October when they first have it available and get a dish. When I got my ice cream maker this year, pumpkin pie ice cream was at the top of my list, even though it was only spring. I've waited patiently until now and finally made my own. This ice cream is fall in a dish - it's basically like frozen pumpkin pie filling without the crust. Surprisingly, even our four-year old nephew liked this ice cream (which I was unsure about, but he ate two bowls while watching It's the Great Pumpkin, Charlie Brown). I read a few recipes and found that they were all really low on the pumpkin for my liking and all contained a lot of egg yolks. I decided to forgo the eggs and really pack in the pumpkin so I could taste it. The pumpkin is already creamy, and the end product was perfect for me in terms of pumpkin flavor. This ice cream is not super sweet, so taste the base before you freeze it and add more brown sugar or even a tablespoon of molasses if you want it sweeter. I'm so glad to know that I can make ice cream now with only a few simple ingredients and not all the additives and artificial flavors that are in most commercial ice creams. I've been loving my ice cream maker this year and even have a wintery ice cream flavor or two that I'm hoping to try near the holidays. This recipe will make a bit more than a quart of ice cream. It's great topped with chocolate sauce (we had ours with a homemade chocolate sauce, not pictured) or caramel. I think that some ginger snap cookies broken up into it or on top would also be delicious (and act like a crust). Honestly, I didn't become friends with beets until the past few years. As a kid, I couldn't stand them...as an adult, I love them. We were given a large bag of beets and for some reason I became determined that I must make borscht. Why? I'm not sure - other than the fact that I like to try cuisine from all over the world. I've never eaten borscht, but for some reason I felt like it was my duty to turn some of these beets into it. There seem to be numerous spellings of borscht and even more ways that you can make it. I read a bunch of different recipes, surveyed my fridge and freezer, and this is what I came up with. I must say that both my husband and I were pleasantly surprised by how much we enjoyed it. This recipe is a bit time consuming, but it's worth it to get the best flavored broth and to get a lot of the excess fat skimmed off the top. This photo is from right before we ate it, but, like pretty much any soup or stew, it gets better the next day. It's a nice meal for these cold and rainy days we are having and it will easily serve four to six people.